My little sister recently took a trip to South Korea, so naturally, when she asked what souvenir I wanted, I said nail polish. She came back with the eight beauties, plus some fun nail art studs. Obviously, I couldn’t wait to get started! A black and white glitter polish really caught my eye – it’s a translucent polish filled with different sizes and shapes of black and white glitter flecks. Click through to see how I got this look (and why I’m calling it Mint Chocolate Chip)! After my basic manicure prep, I applied two coats of a cute teal polish – it’s called Fallen Angel by VDL, which is part of their Festival Nails collection. The bottle is shaped like a high heel! How adorable is that? Anyway, the VDL bottles had names in English, but the Modi Juicy Nails glitters had names in Korean, so I’ll just have to describe them! I applied two coats of a black and white (#21) Modi Juicy Nails glitter. I really liked how buildable this glitter was. It’s not very dense, but the polish is thin enough that you can apply several coats to get a customized look. I finished the manicure with one coat of Essie’s Good to Go – my staple to keep my manicure looking its best! After I giddily posted a pic of my fresh manicure on Twitter, a friend of mine replied and said it looked like mint chocolate chip ice cream – thus, the title of this blog post! 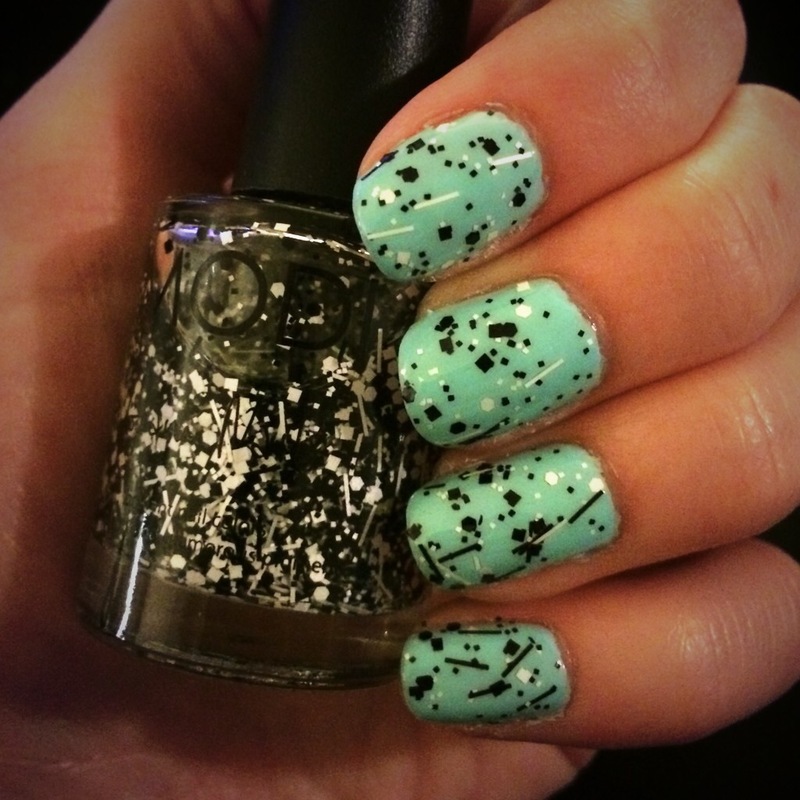 What do you think of this week’s Manicure Monday? How wonderful to have these polishes from Korea. The look you created is exactly that of the chocolate chip mint ice cream! Thank you! I’m so happy I got to try these polishes out and share the results with you!